From left: Ropate Gabriel Sivo, Pauliasi Ratu, Oscar Nanova, and Napoleon Taumoepeau. The Pacific Games is upon us; all the hard work has been done and now it is up to the athletes to perform as best as they can. The behind-the-scenes preparation for the Games has taken a long time to come to fruition and I must commend the close-knit team at FASONOC who has made this a reality. Cathy Wong who is leading the delegation to PNG, Lorraine Mar who is C.E.O of the organisation, and also Jane Niubalavu and Lyndall Fisher whom have overlooked all aspects of administration. There are so many more people involved and we should commend the whole team for delivering our elite athletes to the Games. In regards to Team Fiji Boxing we also have to applaud our dedicated team who worked so tirelessly behind the scenes to prepare the boxers for this event. In this case it is the four National boxing coaches who have given a tremendous amount of time and effort to develop the fighters to be able to compete at these elite games. First-up is Napoleon Taumoepeau, assistant boxing coach and team strength and conditioning trainer. Born and bred in the United States, Napoleon took up boxing as a teenager in his home town of Tampa, Florida at the 4th Street Boxing Gym. Fighting all of his amateur bouts in the States, Napoleon turned Pro in 2009 and fought his last bout just over a year ago here in Fiji. Now residing in Fiji with his wife and daughter, Napoleon’s passion for boxing has led him to build a world class boxing facility (Suva Boxing & Fitness) where he now coaches amateur boxers. Along with boxing, Napoleon is also a strength and conditioning coach having worked with a number of Fiji’s National Federations. Oscar Nanova is accompanying the team to PNG and will be in the corner during all the boxing bouts. He hails from the village of Yasawa-i-Rara and his grandfather Vereniki was the Light Heavyweight champion of Fiji during the 1930s. Oscar was introduced to boxing while in Australia and he completed a trainer’s course with ACHPER in New South Wales. He is married to Asinate Ledua and also coaches at the Boxing Brave Club; he will be sitting his exam for 3 Star Certification AIBA Coach while in PNG. Ropate Gabriel Sivo is our next coach and he hails from the village of Driti in Bua, he is a career Police officer and has trained the Police Team since 2012 and this year has taken over as trainer for both the Army and the Police who have a combined Boxing Team called “The Force”. Ropate hopes to complete a 3 Star AIBA certified course in the near future which will qualify him to take our National team for International competition worldwide. Finally we have our head coach Pauliasi Ratu, who needs no introduction to boxing fans. He is a former Fiji champion boxer and has fought all over the world professionally in places like Hiroshima, Japan, Auckland, New Zealand and in Queensland and New South Wales, Australia. Ratu comes with a wealth of experience and will also be sitting his exam for three Star Certification AIBA Coach whilst in PNG with the team. 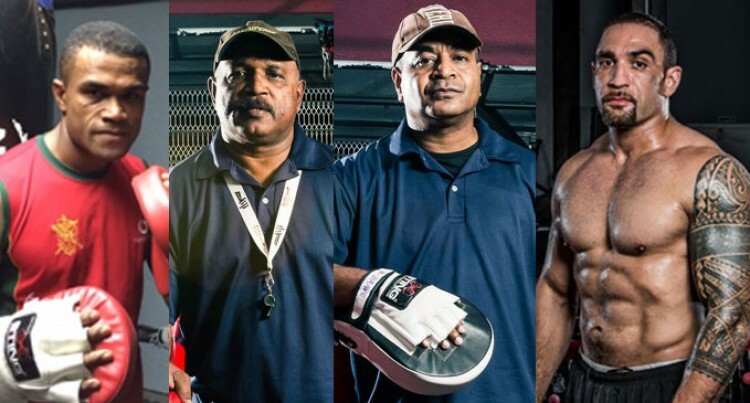 These are the dedicated individuals who build the foundation of the elite boxers who will be representing Fiji at the Pacific Games and I am sure there are many other unsung heroes from other sporting federations who work tirelessly to get the best out of their athletes come competition time. On behalf of everybody at the Fiji Sun we wish all of Team Fiji the very best in the upcoming weeks of the 2015 Pacific Games.